Responding to a volley of patent royalty lawsuits initiated by Apple, Qualcomm on Monday escalated the legal battle with a countersuit claiming the litigation is a gambit seeking lower licensing fees. Slide from Apple's initial complaint against Qualcomm. In a 134-page filing with the U.S. District Court for the Southern District of California, Qualcomm provides a point-by-point rundown of Apple's January lawsuit, denying a total of 389 allegations. "Apple's complaint, and each and every claim stated therein, fails to state a claim on which relief can be granted," Qualcomm says. As noted by CNET, which reported on the filing earlier today, Qualcomm is citing 35 specific defenses to Apple's allegations. Along with legal doctrine, the chipmaker claims Apple's accusations are unfounded. Specifically, Apple's claims to breach of contract are nullified because Apple itself breached the cooperation agreement. Further, Apple has not suffered tangible injury, antitrust or otherwise, meaning the company is not eligible for damages, the countersuit says. Apple's goal, Qualcomm says, is to pay less than fair market value for access to Qualcomm's standard essential patents. Qualcomm CEO Steve Mollenkopf said much the same during an earnings conference call in January. have consistently paid royalties reflecting that value to Qualcomm for years," Qualcomm said in today's filing. "So Apple has attempted to force Qualcomm to accept less than fair value for the use of its intellectual property by wielding its immense power over Qualcomm and by engaging in a host of unlawful acts [...]"
Qualcomm goes on to claim Apple is in breach of contract, has interfered and continues to interfere with contract manufacturers, withheld a redacted amount of licensing fees in relation to a separate contract not at issue in the instant case, and wrongly induced regulatory action against Qualcomm in a number of jurisdictions. Apple also cast Qualcomm chipsets in a bad light by not activating certain high-performance features in iPhone 7 modems, then prevented Qualcomm from revealing mismatched performance metrics compared to Intel modems, which were used in select iPhone 7 models. In November, Apple was accused of intentionally throttling Qualcomm LTE chips to match the performance of Intel modems deployed in handsets built for the AT&T and T-Mobile wireless networks. A follow-up report claimed to confirm the move, noting Apple limited Qualcomm modems in Verizon and Sprint units to achieve performance parity across the iPhone 7 lineup. Apple in January filed suit against Qualcomm, claiming the firm participates in monopolistic practices, price gouging, extortion and more. 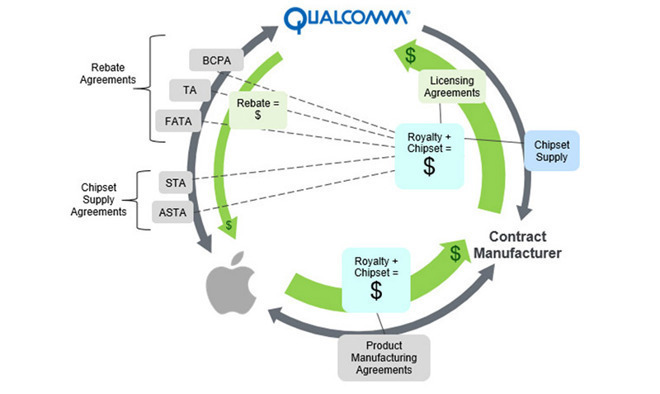 Apple went on to claim Qualcomm abuses its "monopoly power" of the mobile wireless chip market to flout FRAND (fair, reasonable and nondiscriminatory) patent commitments and charge customers exorbitant royalty rates on standard-essential patents. Further, the chipmaker restricts sales to buyers who agreed to license its SEPs, a practice Apple refers to as "double-dipping." According to Apple, the suit was triggered by Qualcomm's supposed decision to not pay nearly $1 billion in licensing rebates after Apple cooperated with a Korea Fair Trade Commission probe into the chipmaker's business practices. The KFTC ultimately leveled an $854 million fine against Qualcomm for what it calls an "unfair business model." Apple later filed two additional lawsuits against Qualcomm in China. Apple CEO Tim Cook called the litigation a "last resort," saying the chipmaker insisted on "charging royalties for technologies that they have nothing to do with." Cook suggested Qualcomm's onerous licensing strategy was inhibiting Apple's ability to innovate. Qualcomm in its countersuit seeks attorneys' fees and unspecified compensatory, punitive and restitutionary damages from Apple, including those associated with breaches of contract, unfair business practices and unjustly retained payments.